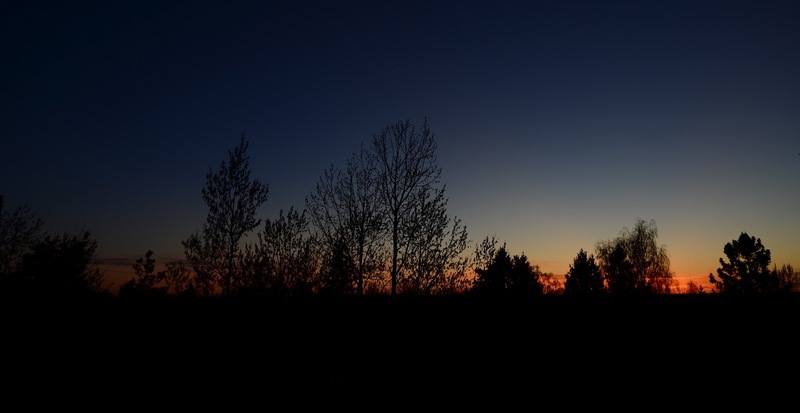 Something terrible happened last week. 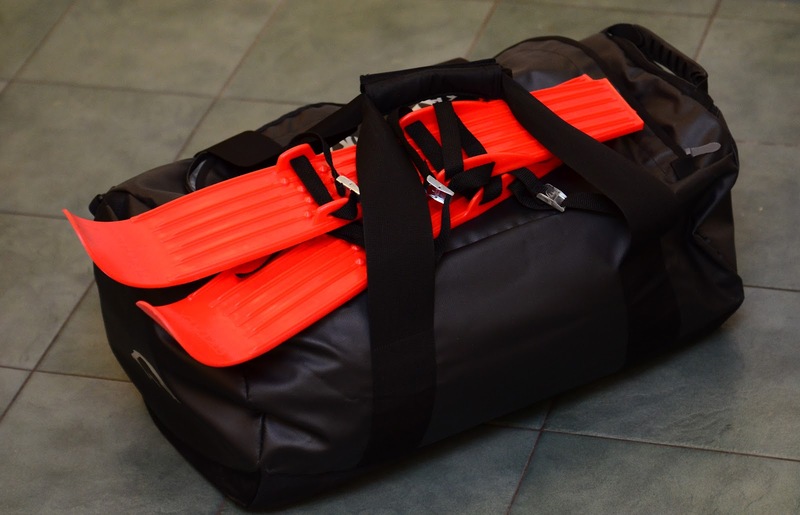 On Friday we learned that a friend lost his life skiing down from Mt. McKinley. I do not want to talk about the accident, writing this text alone is hard enough. But I thought I'd return to a few happy memories with Ilkka. And he was a great skier and climber. 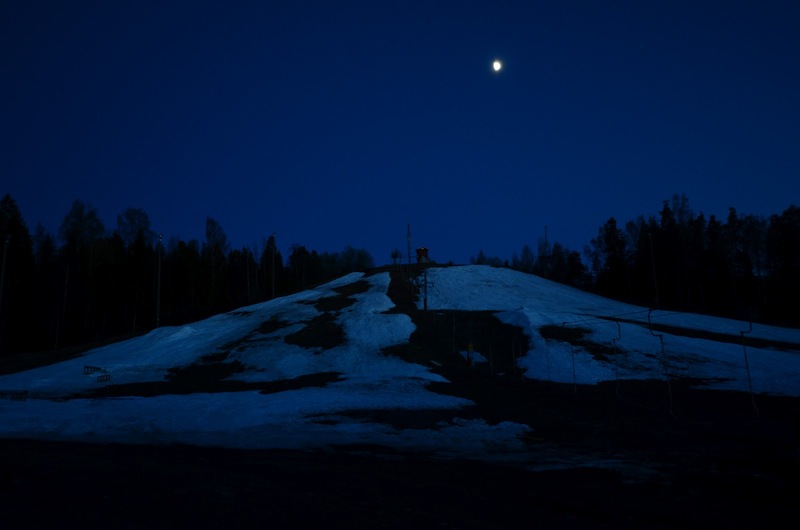 One of the best in Finland; he was the first Finn to ski down from a 7000 meter peak, for instance. He was always in control, always knew what he was doing, always seemed to have more strength left than others. And he was a constant source of climbing ideas and opportunities. When I visited him in Oulu in the early 2000s, we once went ice climbing on a dam wall in the city center of Oulu. The next winter he took me to an old construction crane they had acquired from somewhere, put up next to a river, and added a pump. 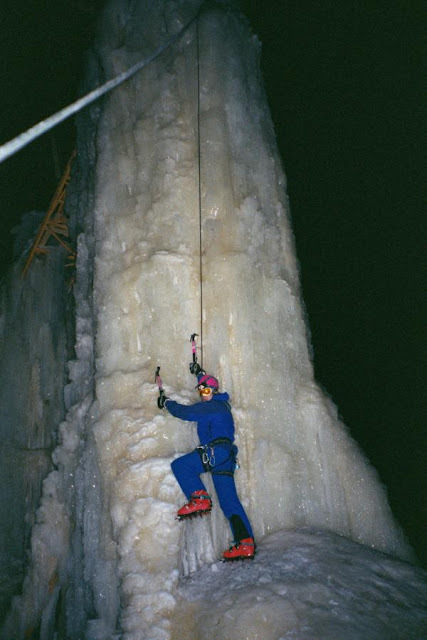 It was wonderful for ice climbing. Who comes up with such brilliant ideas? Global warming is real. I can tell it by the speed that Glacier du Kauniainen is melting. Luckily the glacier always grows back in December for some reason. Maybe some temporary ice age that always hits us at that time. 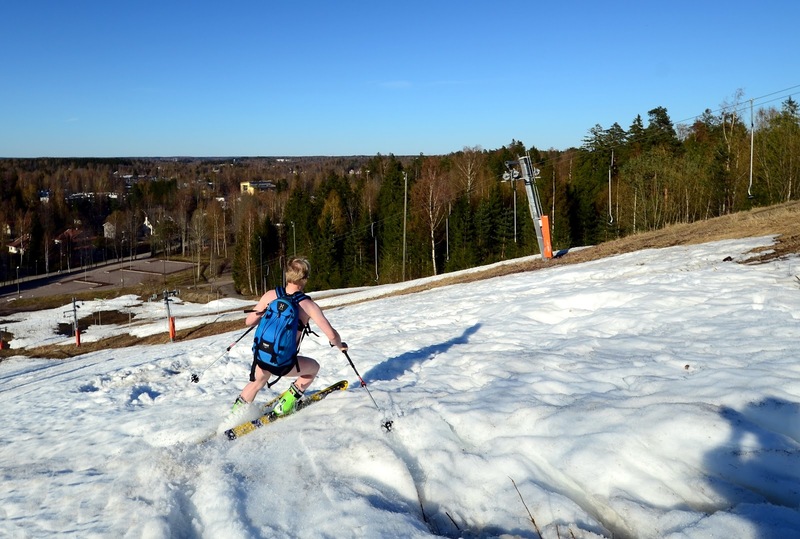 Last week I wrote about our supposedly last ski run in Kauniainen. 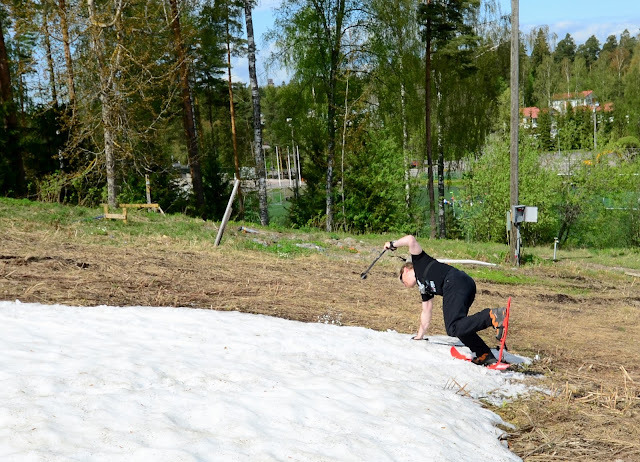 Well, it turned out that there is still snow left this weekend. Not much, only about a meter and half. It is probably gone by the end of the day, so this will the real end of the season. 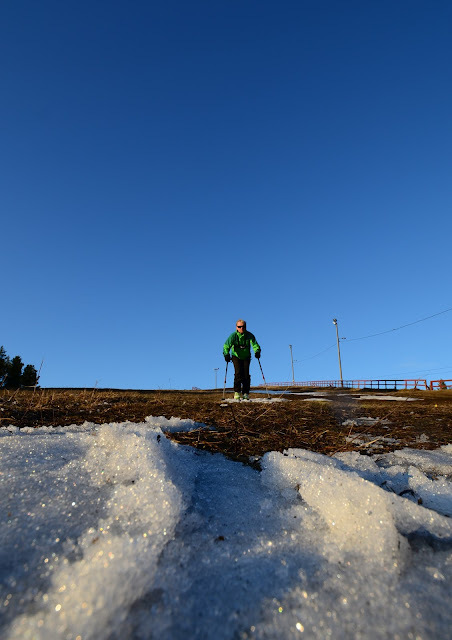 With such as small patch of snow, the skiing was not that great. So I went to the top of the hill and tried grass skiing as well. I figured that with the 9.90€ miniskis, it wouldn't matter so much if there'd be damage to the skis. To my surprise it was possible to ski the grass all the way down. 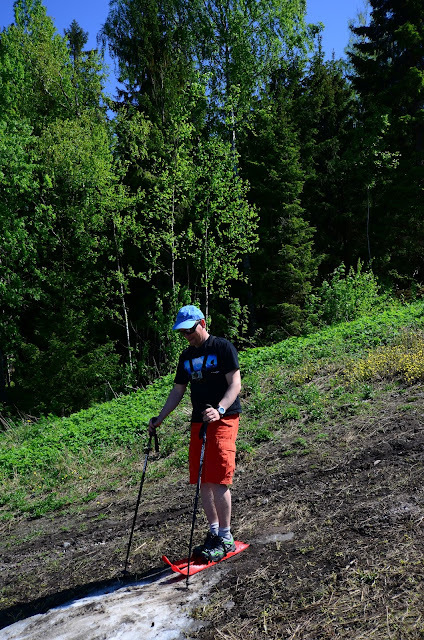 Though it would have been better had the slope been much steeper. 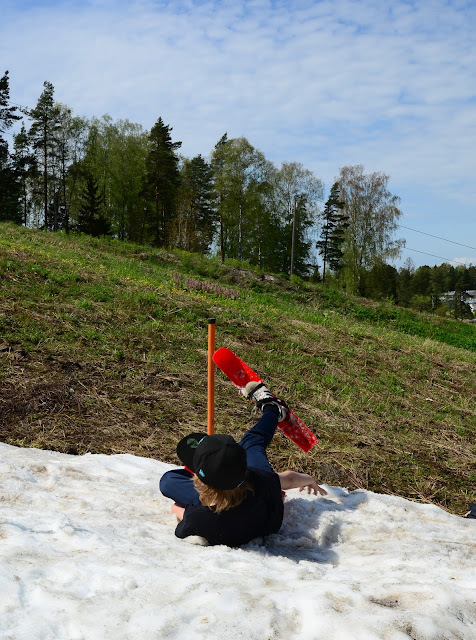 The ski hill in Kauniainen is already pretty steep, so this just goes to show that friction on grass is far higher than on snow. Interestingly, dead grass is also more slippery than growing grass. May 20, and we are still skiing in Kauniainen. Or Grani, as it is affectionately called. My local ski hill is a treasure that just keeps on giving. 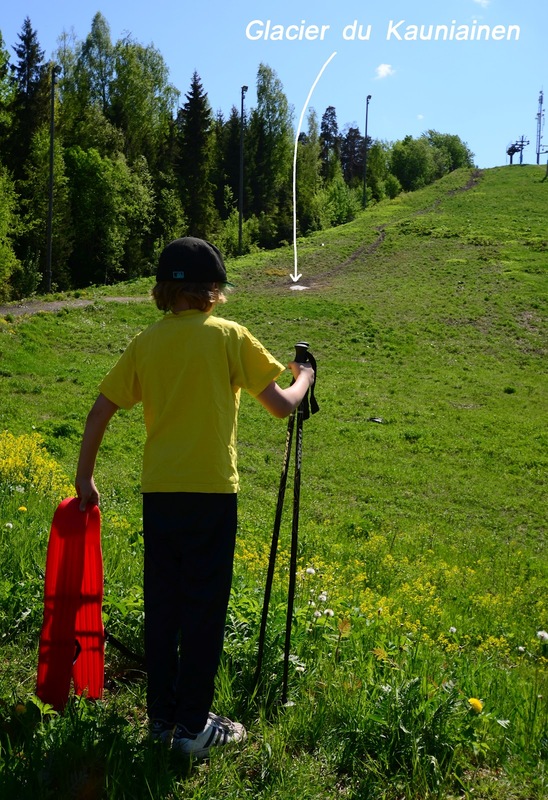 I have lost count how many times I have written about the last ski run of the season on this hill, just this year. And there is still snow! 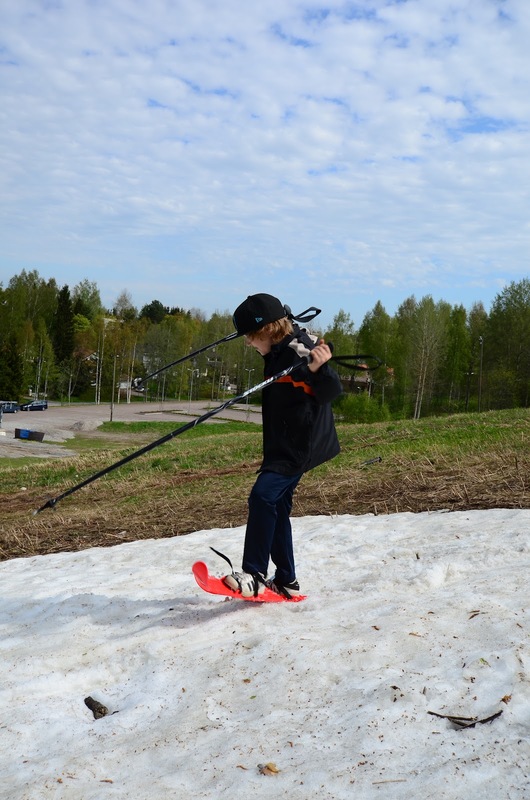 There is only a small patch of snow left, however, so we've appropriately chosen to use small skis. Or miniskis as they are called. On my recent trip to Bolivia I had these skis for backup, but never needed them. But I've been itching to try them out. However, I had never used them when I was a kid, so the experience was entirely new. I must say that they are far harder to use than I imagined. It would have been dangerous to put them on for the first time at 17,000 feet on that icy 40 degree slope in Bolivia last weekend. The binding mechanism is not secure and keeps coming off. The skis are so short that there is no balance. Even my son Janne who normally wants to ski without poles wanted poles for additional stability today. The sides are all plastic, so edging on ice would have been difficult. After a couple of runs we started to understand how to ski on the miniskis, but it was still not easy. 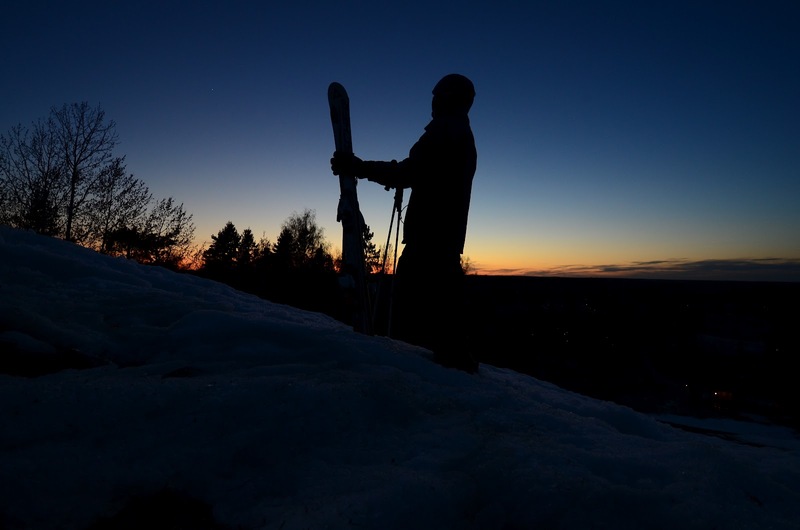 I'm probably fixated to my normal skiing style, unable to adapt to anything new. 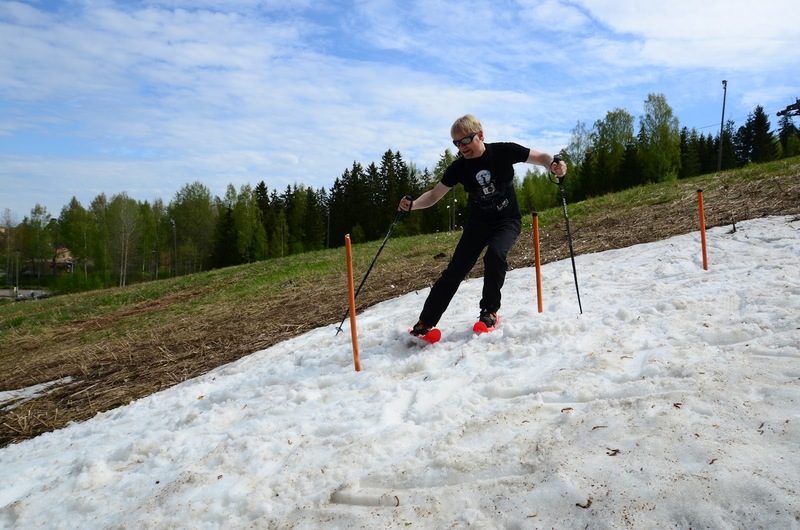 My friend Jarmo found out that it is easier to ski on the miniskis if he uses regular ski boots on them. Seemed to work well for him. 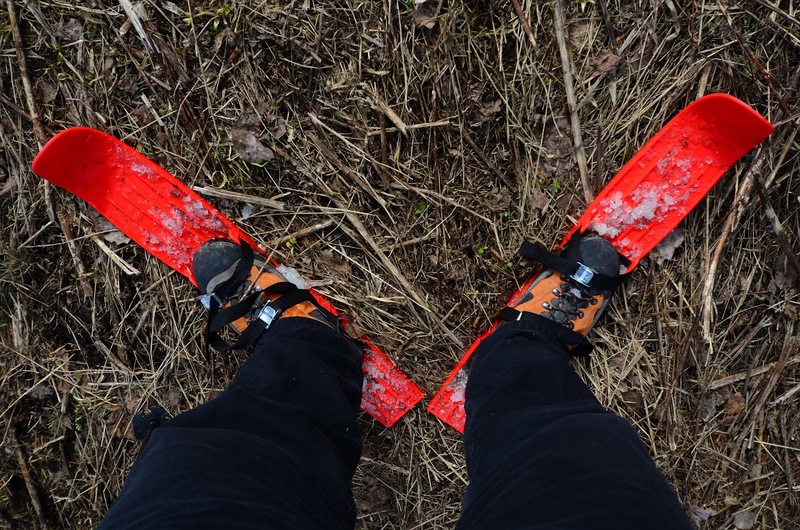 In general, getting the right boot fit so that the skis fit well into them is an issue. 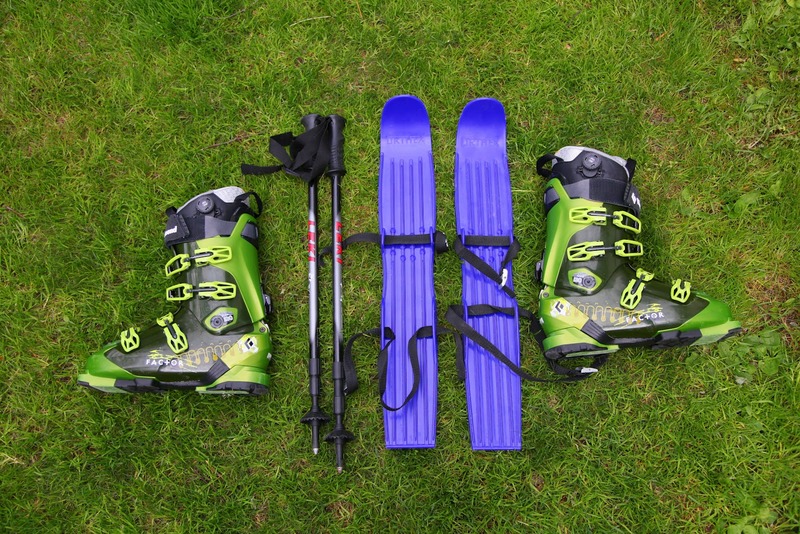 For most men's hiking boots, for instance, the skis tend to be too narrow. Given the lack of stability, a helmet is recommended. Due to being so short, the miniskis are also remarkably easy to climb up with, as long as there is soft snow, grass, or other material underneath that is not too slippery. In any case, the skis were fun for this slope. 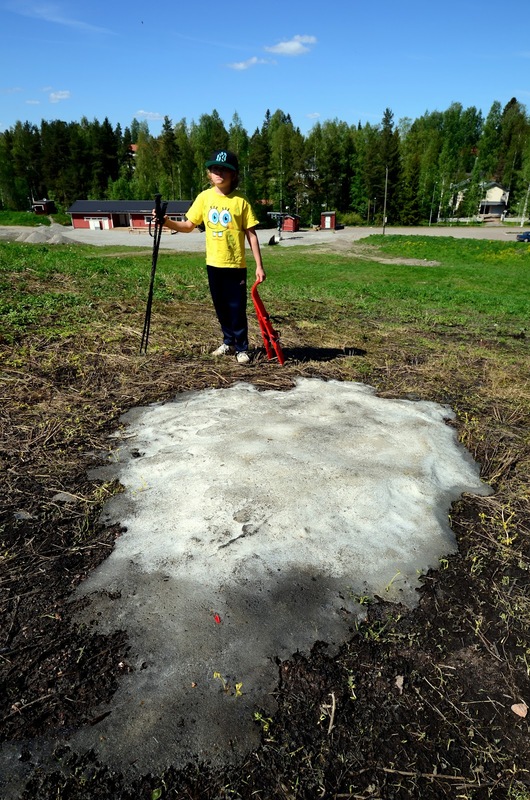 It was very warm, over 20 degrees, and the kids kept finding interesting things from the slope. 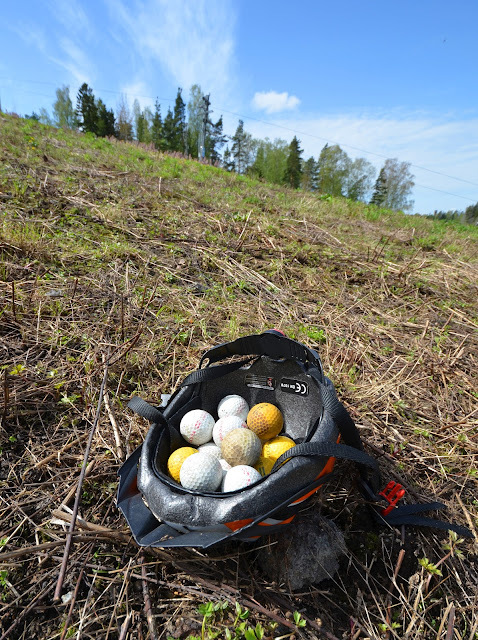 Thirty golf balls, for instance. There were also enough parts of broken race gates so that we could construct our own short race track. This time it may really be the last ski run of the season. I'd love to ski here in June, but ten days seems too far away. 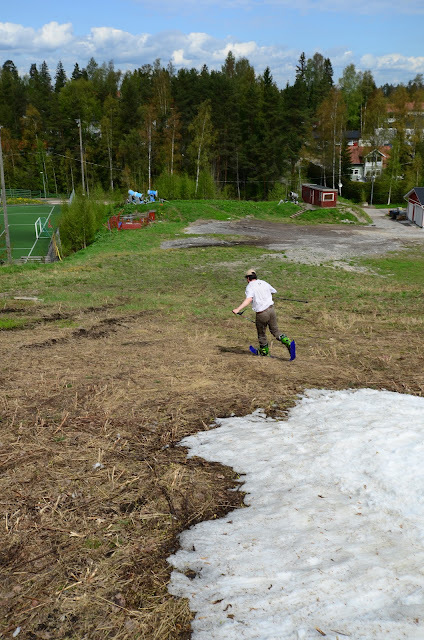 The patches of snow are too small to survive that far. The miniskis are fun to try, good for skiing down from a pile of snow in the yard. But not so good for other types of skiing. 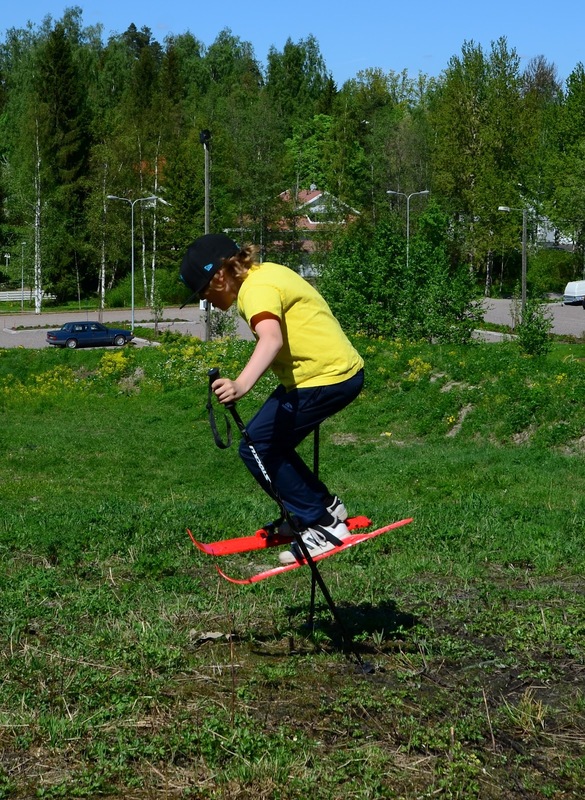 (For starters, they are not for adults, these are children's skis.) And I'm unable to adapt my skiing style to anything else than regular skis. This was also quite evident when I tried snowboarding a couple of years ago. By the way: I will write something about my Bolivian experiences as soon as I have sorted all my pictures. All I can say now is wow, just wow. 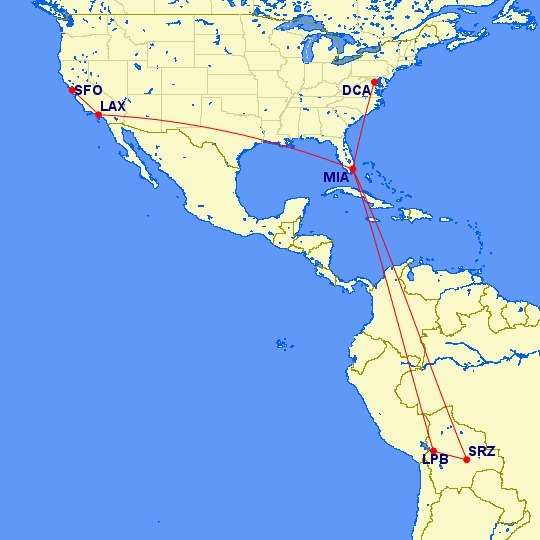 It was an incredible adventure. And I'm so glad everyone is safely back from that mountain. If the slope ends before slowing down, run! But back to Oulu. I have gotten some local help. 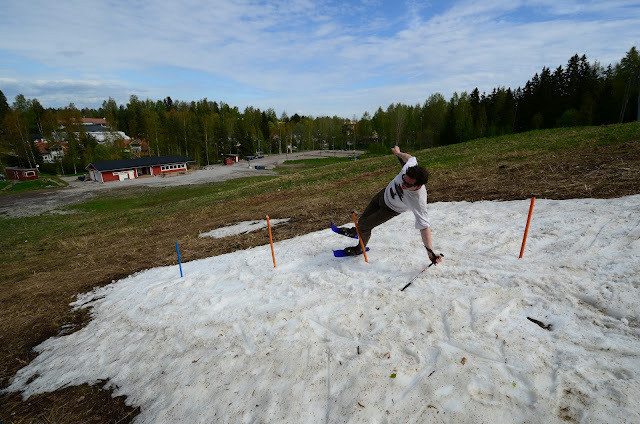 My friend Ilkka has given me a list of places where I might still find some snow. 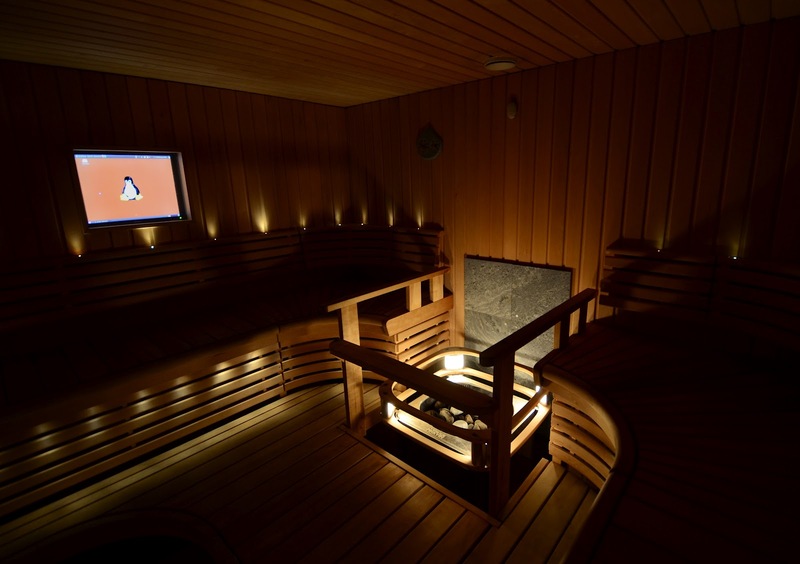 The ones that I have time to try are all in Oulu or within a few kilometers of driving distance. I decide to try Heinäpää in Oulu and Köykkyri in Kempele. 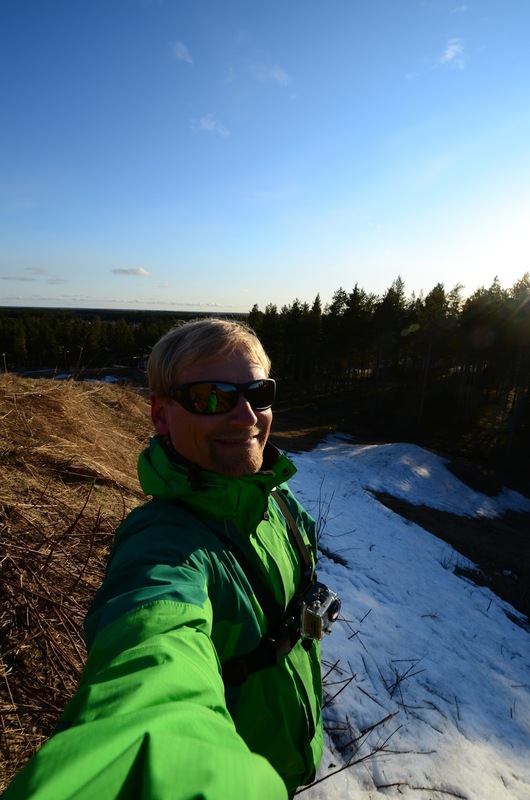 Unfortunately, Ilkka was unable to join me for these adventures, as he had already left for his own skiing expedition. Ilkka: when you finally get to the top of Denali, let us know how the skiing was compared to Heinäpää! Denali or Mt. McKinley is North-America's highest mountain at 6,194 meters. But due to its northern location and cold weather, it often appears on lists of world's most difficult mountains to climb. On the day that I was in Oulu, the weather in Denali was -40 and 60 km/h wind. But hey, it was sunny! 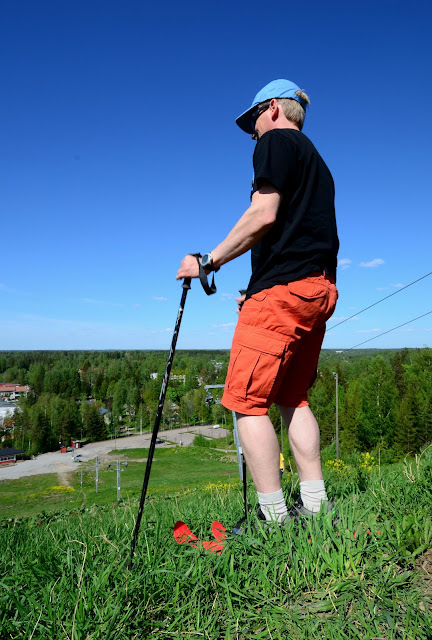 Good luck with your climb, Ilkka! 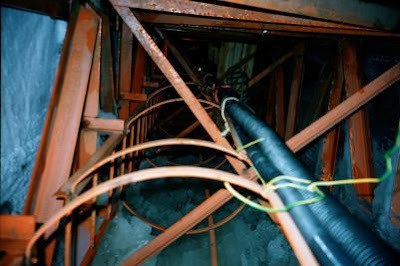 The expedition's progress can be followed from their blog. 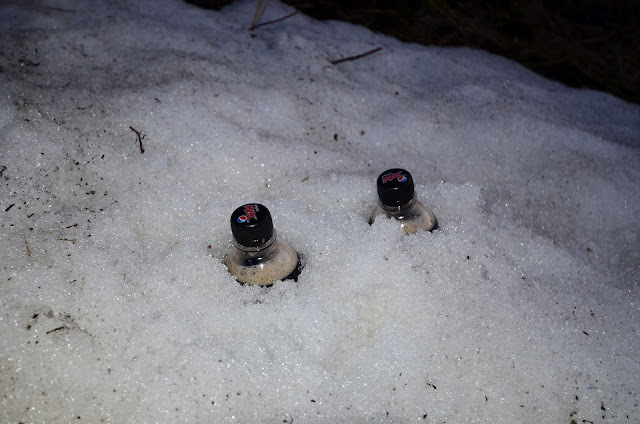 There is some snow left! 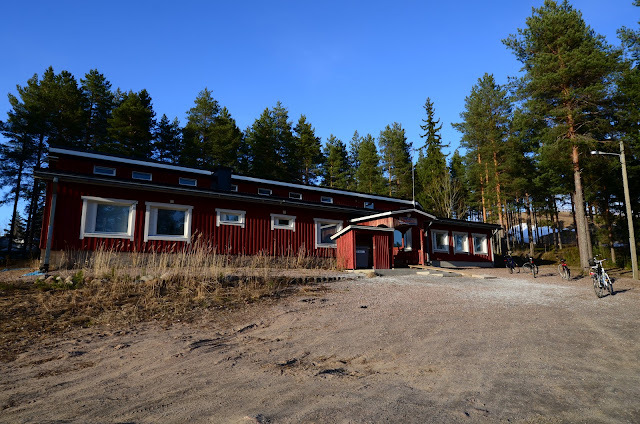 Köykkyri is Finland's smallest ski center at a whopping 25 meters of altitude difference. 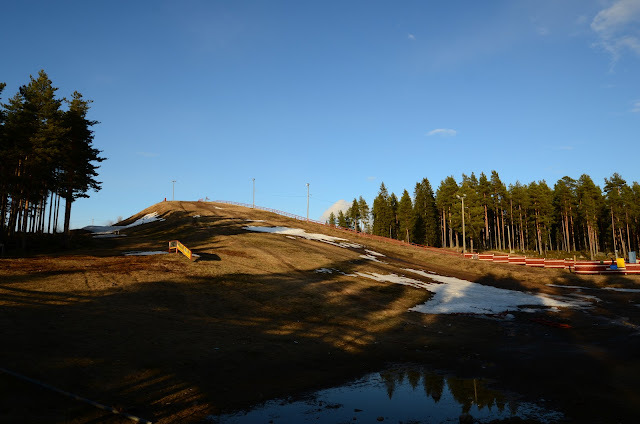 The length of the ski run is 135 meters. Fortunately, I do not have to ski the entire length this time - that would be a full-day expedition. Almost all snow has melted, there's only small patches left. I try to ski them anyway, taking off my skis for the parts between the patches. It would be interesting to visit this place in the winter, though. The place seems like a nice community and club-run operation. I prefer these places over commercial ski operations. The best part of Köykkyri is not really the official slope. Going from the top to the skier's right there's a short but steep face. Steep enough to be fun, and steep enough to hold a little bit of snow even now. Recommended! 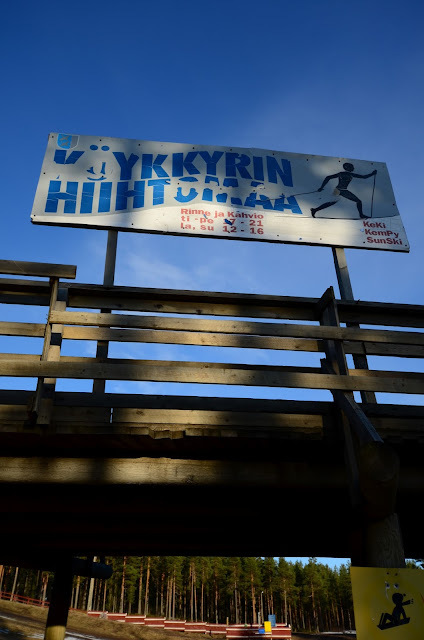 I thought it would not be possible to have a smaller ski area than Köykkyri. 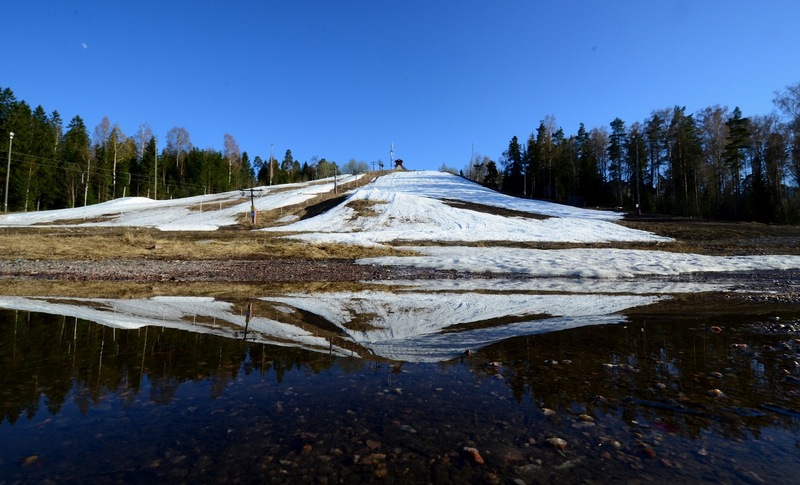 But Heinäpää, a closed ski area is just laughable. The altitude difference is maybe ten meters, if that. 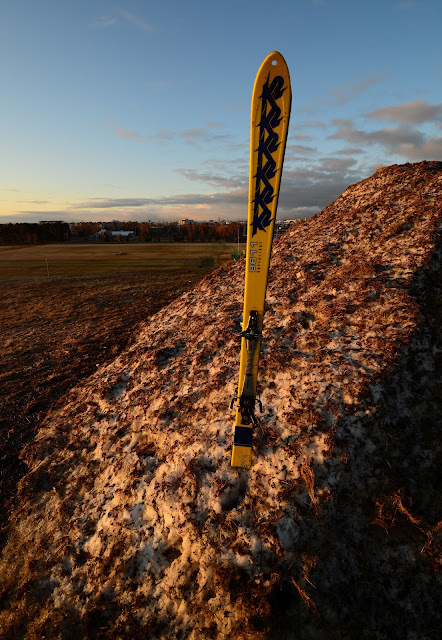 Back in its glory days, it sported Europe's shortest ski lift. The area closed in 2000 due to lack of customers. Go figure. But Heinäpää is not without merits. 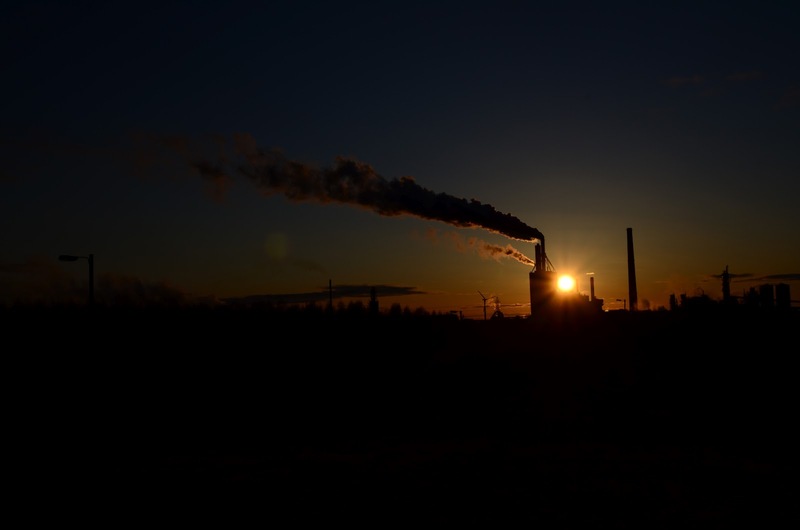 For one, the view towards the paper mill in sunset is awesome. For two, this is an entire sports center with football fields, sports halls, and so on. But the biggest kick that I got was meeting Groke at the top. 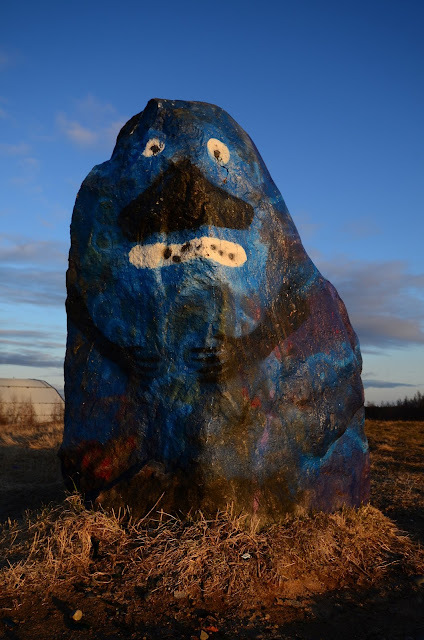 This scary character from the Moomins gave the mountain an icy feeling, even in this spring weather. 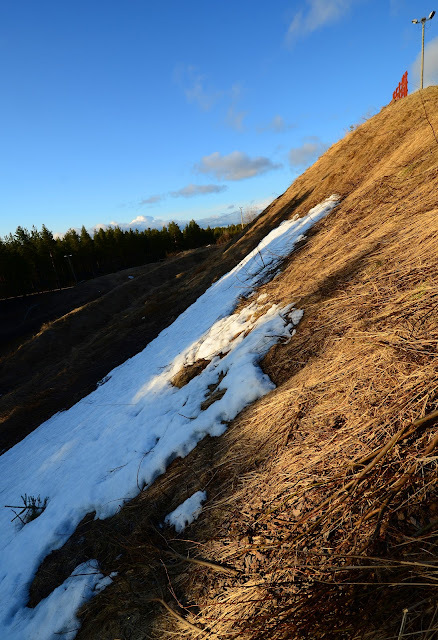 Speaking of the spring weather, the entire hill was free from snow. Luckily at the top there was a two meter pile of snow, probably collected as the paths were being cleaned from snow during the winter. OK, OK, lets say 120 centimeters. 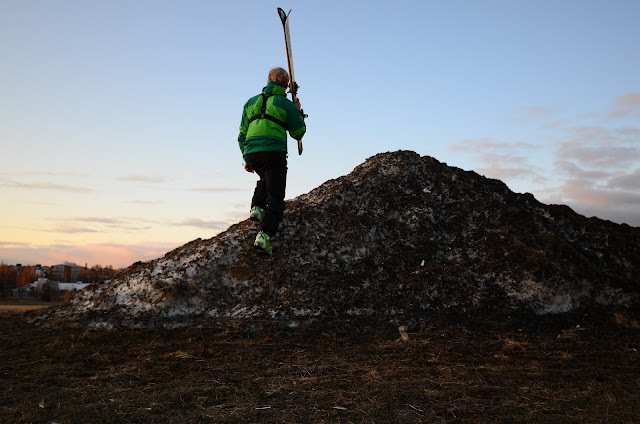 The south face of the pile is all covered by sand and garbage, but the north face has just a little bit of rotting grass on top of the snow. Good enough for me! Put the boots on, climb to the top, ski down, making an almost entire turn. 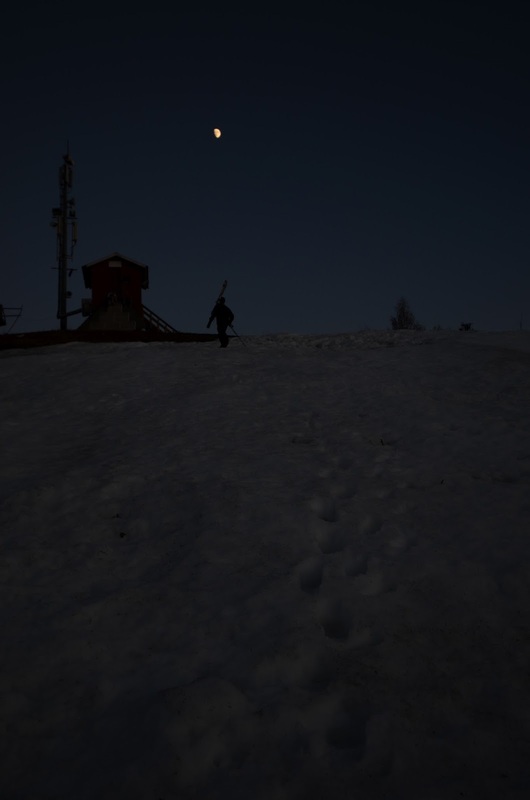 At this time of the year, lift tickets in Köykkyri are pretty cheap. In this millennium, lift tickets in Heinäpää are also very cheap. In both cases you'll have to walk up yourself. The good news is that it is not a very tiring climb. 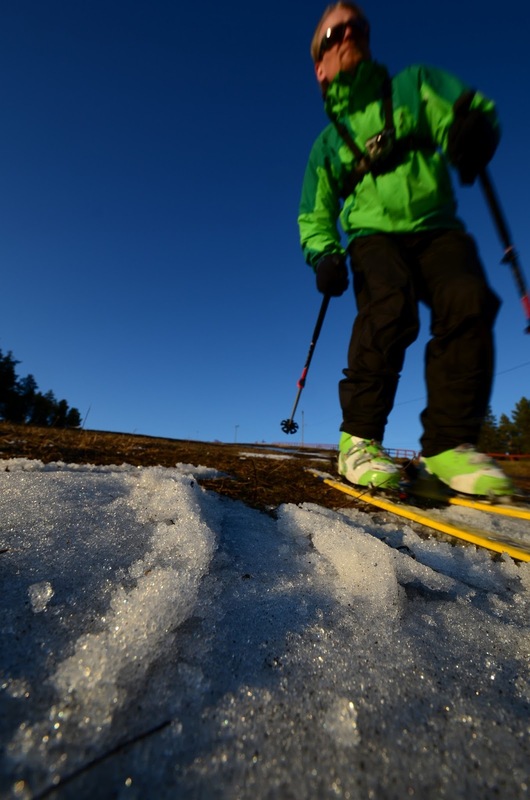 Skiing down Köykkyri under the current conditions took 140 seconds, including all the running and carrying skis between patches of snow. Be sure to watch the video from above as well. 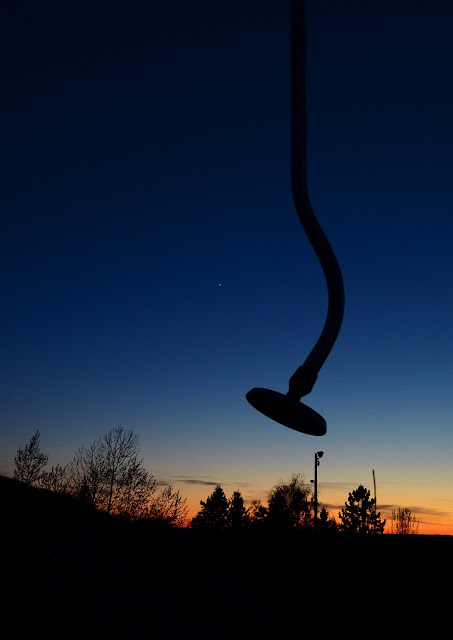 The video includes also episodes 1 and 2 of the Planetskier Ski Maintenance School, on washing your skis and boots after skiing in dirt. Crossing grassy patches. No, crossing snowy patches on grass.